Skinner Boston was the last of the auction houses to hold a December 20th Century sale. Its 20th Century Design auction was held on December 15, 2012, with a few good results. The sale wasn’t terribly exciting, with only a few lots that could be called interesting or selling for $10,000 or more. 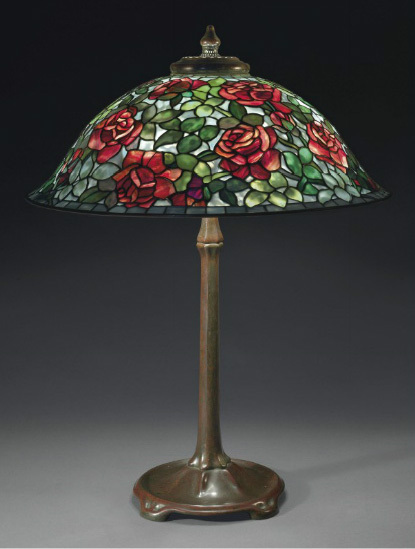 The top lot of the sale was a Tiffany Studios 17″ diameter Poppy table lamp, with decent color, but not in A-1 condition. Estimated fairly at $30,000 – $40,000, it realized $51,000, including buyer’s premium. Two nice Tiffany Favrile floriform vases easily exceeded their estimates of $800 – $1,200 each, with one selling for $7,200 and the other for $9,000, including buyer’s premiums. 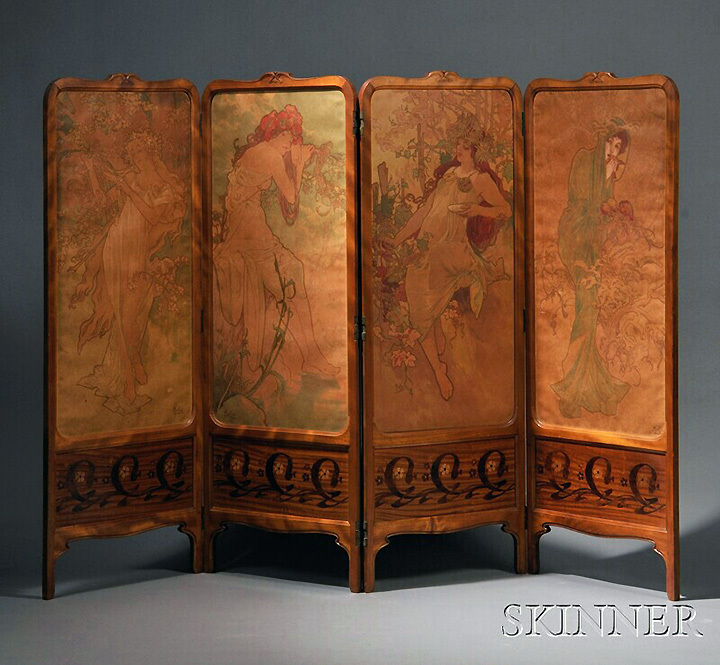 The second highest price paid went to a Les Saisons (The Seasons) screen decorated by the celebrated Austrian Art Nouveau artist, Alphonse Mucha. It went on the auction block with an estimate of $20,000 – $25,000. The final price of $39,000 handily exceeded the high estimate. For the complete results of the sale, click on the following link. Skinner’s 20th Century Design results. 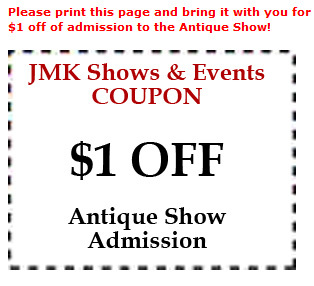 This weekend we will be exhibiting at our first show of 2013, at the Birchwood Manor, in Whippany, NJ, Saturday and Sunday, January 5-6. We will be bringing all of our new and exciting purchases. We’ll have them all on display. Then on to the all-important Miami shows at the end of the month. If you can’t see us in New Jersey, don’t miss us in Miami. 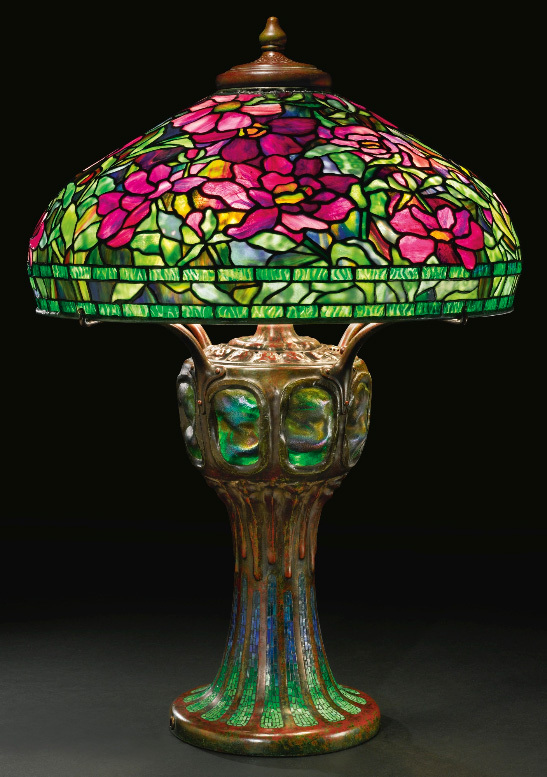 Sotheby’s New York held its Important Tiffany auction on December 15, 2012, immediately following its Masterworks by Tiffany Studios from the Geyer Family Collection auction. The sale did well, grossing $2,950,500. Results were a little stronger in this sale than the Geyer Collection sale. The quality was high in both sales, so I can only speculate that the more conservative estimates in the various owner sale achieved better results. 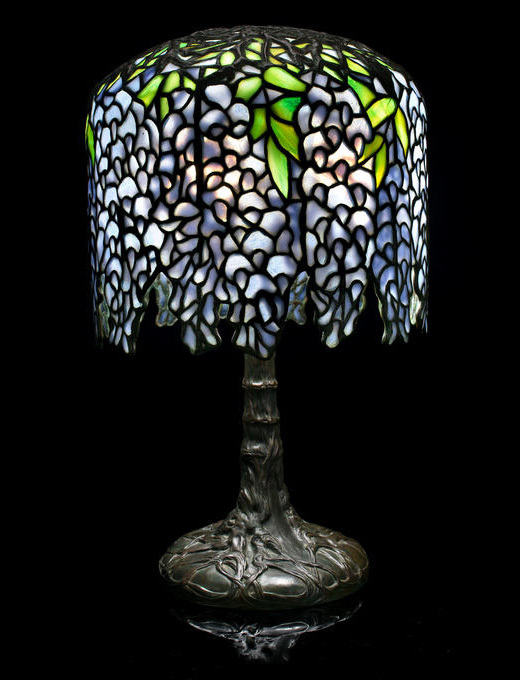 The top lot of the sale was a Tiffany Studios Trumpet Creeper table lamp, with the same form as a Wisteria lamp, but with a rarer flower. It flew past its pre-sale estimate of $400,000 – 600,000, to sell for $914,500, including buyer’s premium. 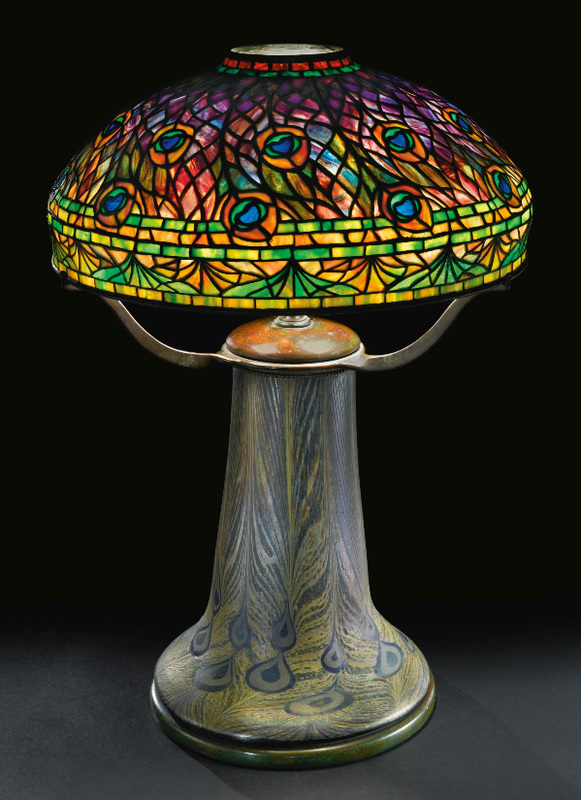 A fine Tiffany Peacock table lamp, with matching Favrile glass base, was the second best lot of the sale. Estimated to sell for $140,000 – $180,000, it handily exceeded its high estimate to sell for $242,500, including buyer’s premium. The prize winner for the most bizarre price paid at the sale goes to lot #333, a 7″ diameter blue Favrile counterbalance table lamp. The shade had decent color with the lamp off and weak color with the lamp on. For that reason, I decided not to bid, regardless of how low the price would be. Instead, it was one of the most competitive lots of the sale. Its final price of $46,875 was approximately five times the low estimate. The estimate of $8,000 – $12,000 was appropriate, so what happened? Easy. Two wealthy, but unknowledgeable bidders, butted heads. Each had more cents than sense (pun intended). The consignor hit a home run and the underbidder should thank his lucky stars that he was outbid. For the complete results of the sale, click on the following link. Important Tiffany results. 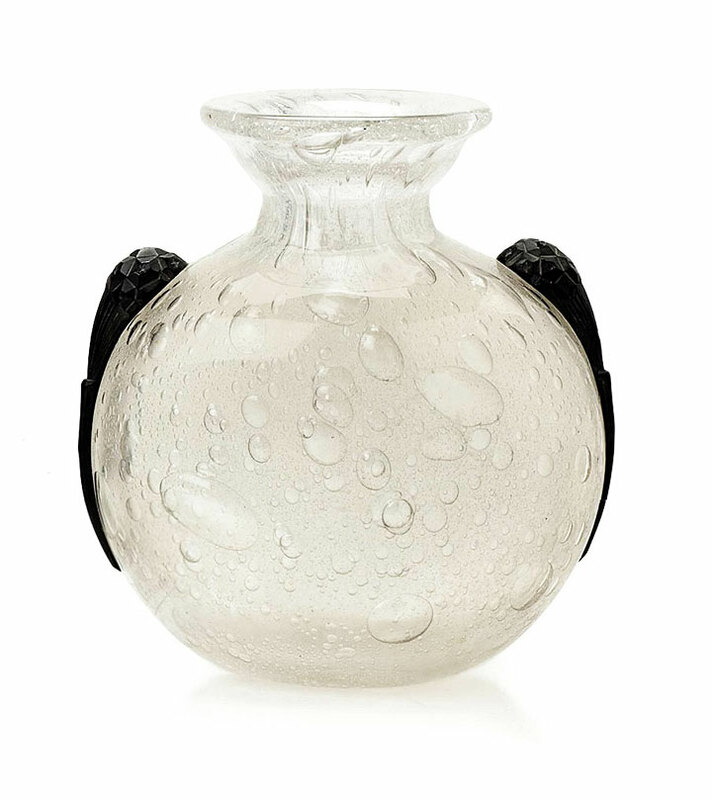 Christie’s New York held its Magnificent Tiffany auction on December 14, 2012, with total sales of $1,124,625. Most prices were unexceptional, so smart buyers had a rare opportunity to buy some nice items at good prices. 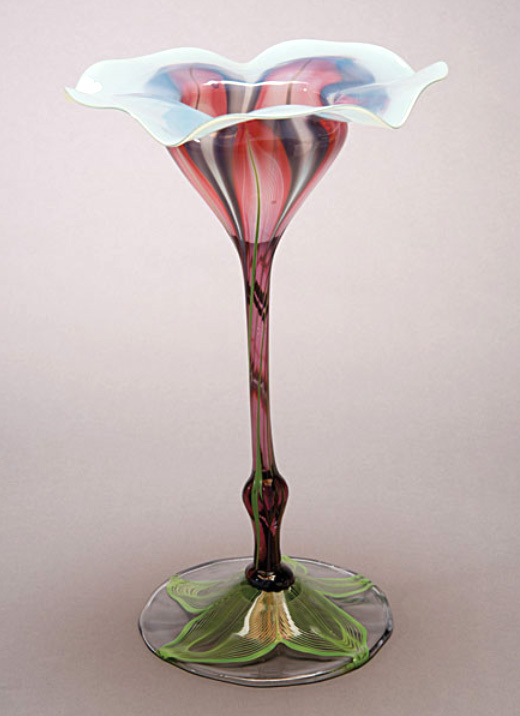 The top lot of the sale was a rare, but boring, Tiffany Favrile reddish floriform vase. Sold as lot #10, it realized $134,500 — below the pre-sale low estimate, including buyer’s premium. 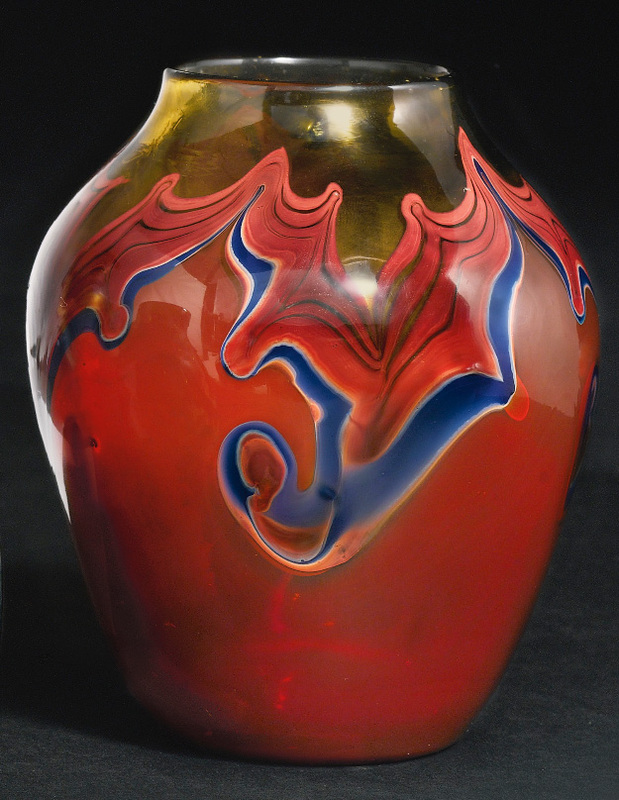 The vase was not exciting, so the estimate of $120,000 – $180,000 seemed far too aggressive. The consignor was lucky to have sold the vase. 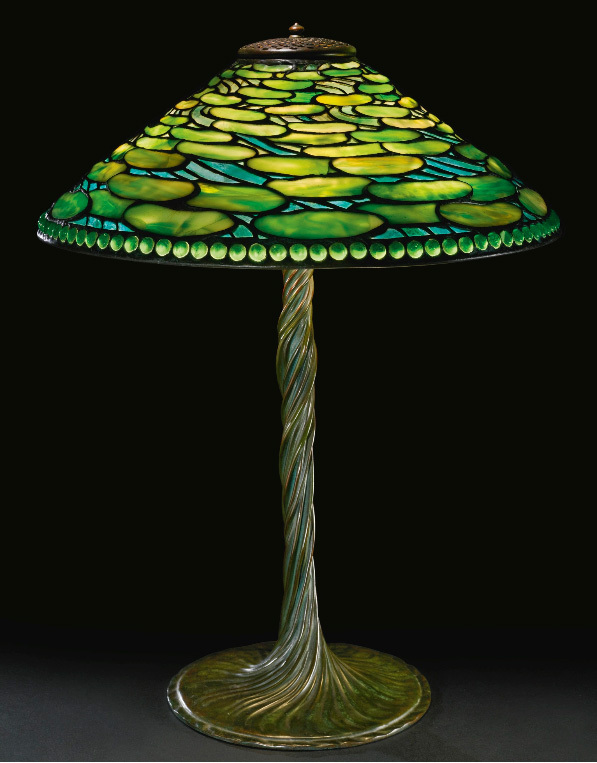 Two Tiffany Studios lamps tied for second place, both selling for $86,500, against identical estimates of $70,000 – $90,000. One was lot #3, a very nice 25″ diameter Rose table lamp and the other was lot #8, a 20″ diameter Daffodil. 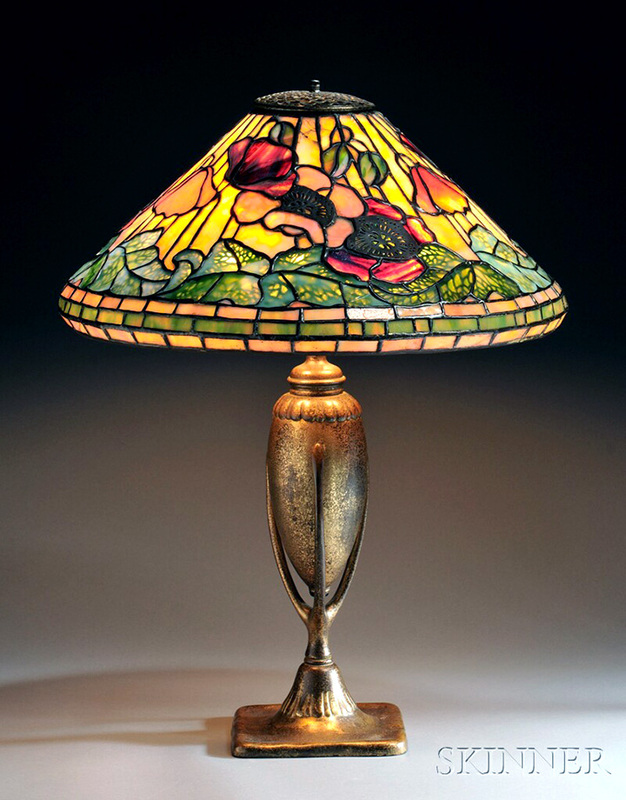 A few bargains were had by sharp buyers, including a Tiffany Studios 18-light lily table lamp. 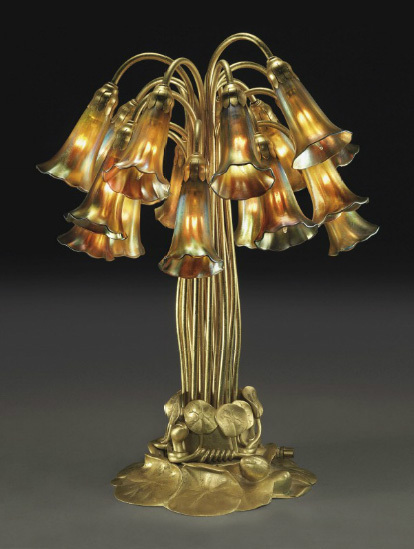 18-light lily lamps are much rarer than 7, 10 or 12-lily lamps and usually sell for $100K and up. This example sold for $56,250, against a pre-sale estimate of $45,000 – $55,000. Kudos to the buyer. For the complete results of the sale, click on the following link. Christie’s Magnificent Tiffany results. Every year all the major and many secondary auction houses hold a 20th century decorative arts auction in December. This year Bonham’s New York was the first of the majors. 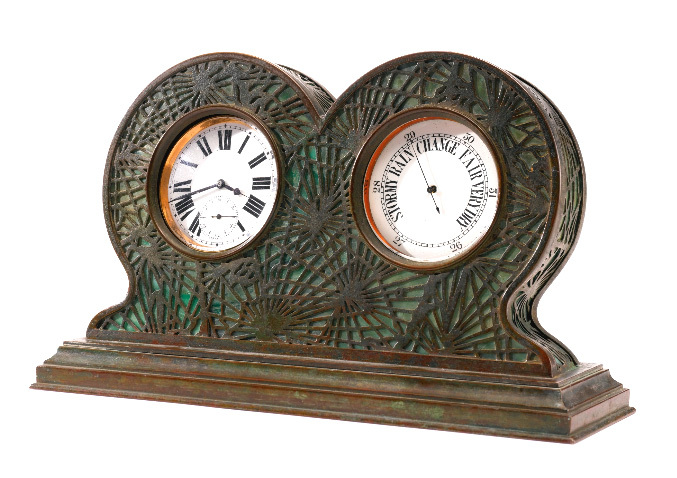 They held their 20th Century Decorative Arts auction on December 11, 2012. Christie’s was next (this Thursday’s blog) and Sotheby’s was last (next Monday’s blog). Bonham’s results were good, but not superlative. 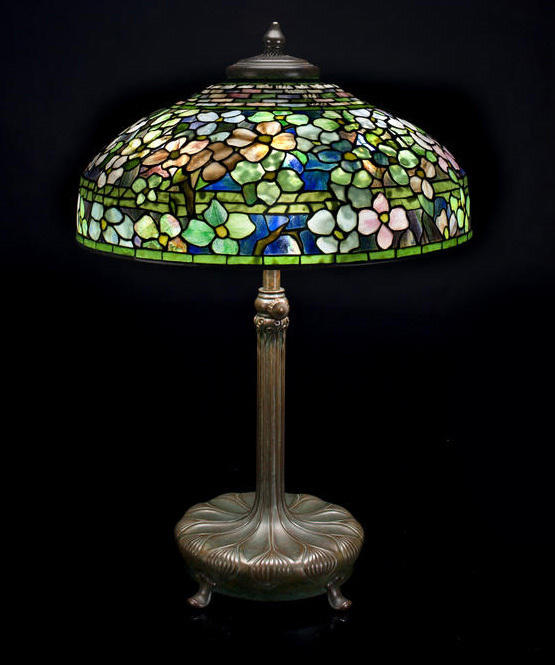 Two Tiffany Studios lamps tied for top lot of the sale. #2047 was a nice 20″ diameter Dogwood. Estimated to sell for $80,000 – $120,000, it realized $104,500 — within the estimate. Lot #2049 was a Tiffany Miniature (Pony) Wisteria lamp. It carried the same estimate as the Dogwood lamp and brought the same result. Auction houses may have to reveal the names of consignors if a ruling by a court in New York State is upheld. The decision by the Supreme Court of the Appellate Division of New York State was announced September 19, 2012. It stated that an auction house does not have an enforceable contract unless it includes the names of the buyer and seller. 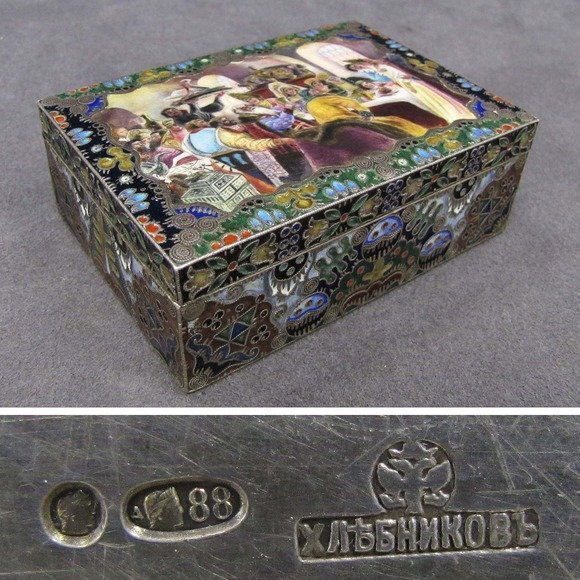 Specifically, William J. Jenack Estate Appraisers & Auctioneers, of Chester, New York, tried to collect payment from a buyer who purchased a Russian enamel box at auction on September 21, 2008. The lot, #193, was described as “FINE RUSSIAN SILVER/ENAMEL COVERED BOX WITH GILT INTERIOR, SIGNED I.P. KHLEBNIKOV, 19TH CENTURY. HEIGHT 1 1/2″; TOP 2 1/2 X 3 5/8″ (ESTIMATE $4000-$6000) NOTE: There are two slight enamel chips on left side of enameled picture.” Phone and Internet bidders sent the final price to $400,000. The buyer never paid, claiming fraud by the auction house. He stated that Jenack artificially pushed the price to $400,000. The first ruling, in 2010, by the New York State Supreme court, was in Jenack’s favor. It ordered the buyer to pay $402,398. The appellate court reversed the ruling, based on General Obligations Law 5-701, which states that the names of both the buyer and seller be included. As practiced today, auction houses never reveal the names of consignors, unless the consignor wants it known. Sometimes a lot will state “Property of a Gentleman” or “From a New York City Estate”. If the consignor is famous, the name is revealed, because it’s helpful. What would happen to consignments if auction house were forced to reveal the names of consignors? Many sellers would be reluctant to consign, so auction houses would have a much more difficult time attracting consignments. It’s conceivable that some weaker ones will be put out of business. The story is not over. It’s possible the case may go to New York’s highest court, the Court of Appeals. It’s been reported that Christie’s may join in the case. Every auction house will be affected by the final ruling. Some are holding their breath. Michaan’s Auctions held its Treasures of Louis C. Tiffany from the Garden Museum, Japan sale on November 17, 2012, with fairly disastrous results. Approximately $3.5 million sold against a low estimate of $15 million. What could have caused such a debacle? Following is my understanding, based partly on information from a very reliable source. Let’s start from the beginning, as best I know it. Takeo Horiuchi, a successful Japanese real estate investor, amassed a comprehensive and mostly wonderful collection of Tiffany Studios items over a period of approximately 17 years, aided mainly by Alistair Duncan, author and reputed Tiffany expert. Mr. Horiuchi displayed his collections at different museums that he constructed in various locations in Japan. Recently Mr. Horiuchi decided to sell his entire collection, concerned about the possibility of damage by earthquakes. Mr. Duncan represented him in the sale. The first prospective buyer had a deal to purchase the entire collection for $58 million. He passed, based on his conclusion that the collection wasn’t worth the asking price. Ultimately, Alan Michaan was persuaded by Mr. Duncan to purchase the collection. Surely Mr. Duncan’s purported 7-figure commission helped his powers of persuasion. What Mr. Michaan did not know was that some of the valuable items in the collection were not as represented. Supposedly some were not authentic and several had important condition issues, like cracks in the Lava vases. Most everything in the sale was authentic, but there were questions about a few items. Fast forward to the auction. Michaan made the classic and fatal error of putting very high estimates (and reserves) on the items in the sale. It appeared to be a retail sale, rather than an auction. Had the items been estimated conservatively, they would have garnered much more interest and bidding. Consignors who are willing to risk a loss (with a low reserve) generally come out smelling like roses. Interest and bidding are strong and the high estimates are usually exceeded. In this case, Michaan was both the consignor and auctioneer and apparently not willing to lose on any individual item. If the auction had very low reserves, I can assure you the sale would have done fabulously well. Not every lot would have been a winner, but the winners would have far outweighed the losers. Mr. Michaan should have trusted the buyers to know what to pay. The rewards would have come to his bottom line and to his reputation. 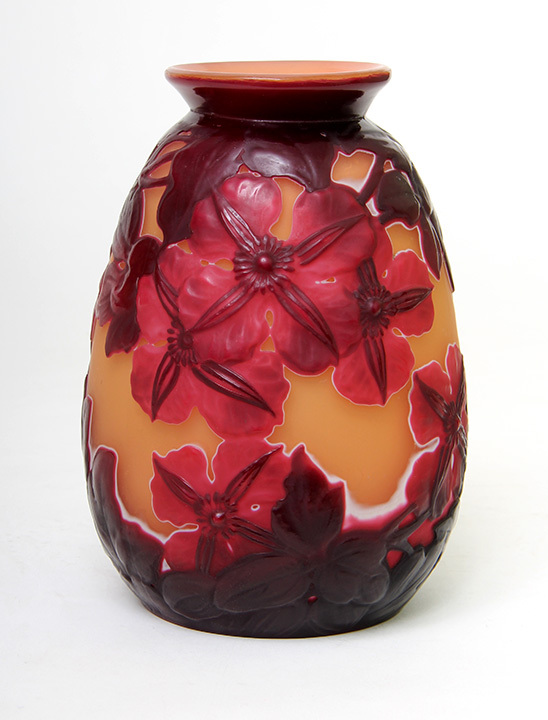 Some items did sell well, including a gorgeous and rare red Tiffany Favrile floriform vase. Estimated to sell for $250,000 – $350,000, it realized $236,000 including the buyer’s premium — below the overly-high low estimate. 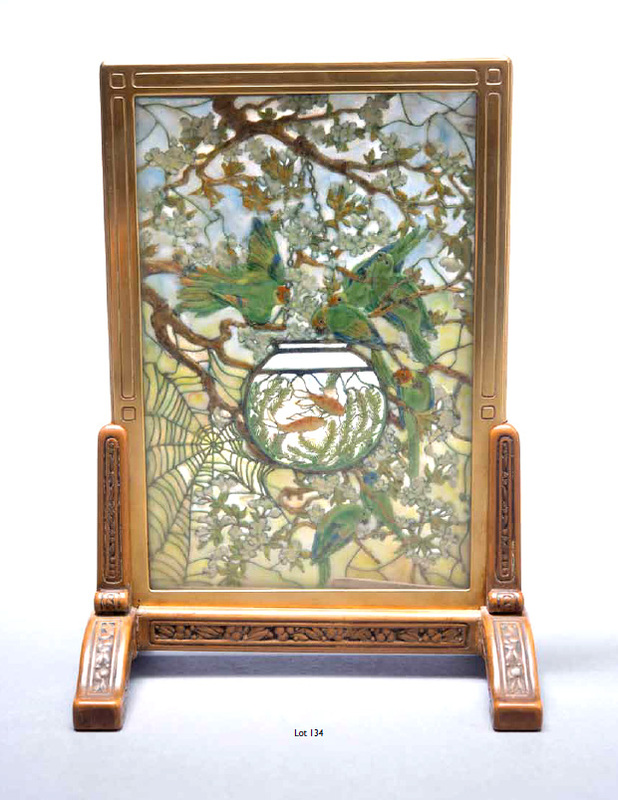 A small, but superb, enameled Tiffany tea screen sold for $324,500, below the aggressive estimate of $400,000 – $600,000. This could and should have been a great auction that would be remembered for years to come. Unfortunately, it will be remembered for years to come for the wrong reasons. For the complete results of the sale, click on the following link. Michaan’s Tiffany results. 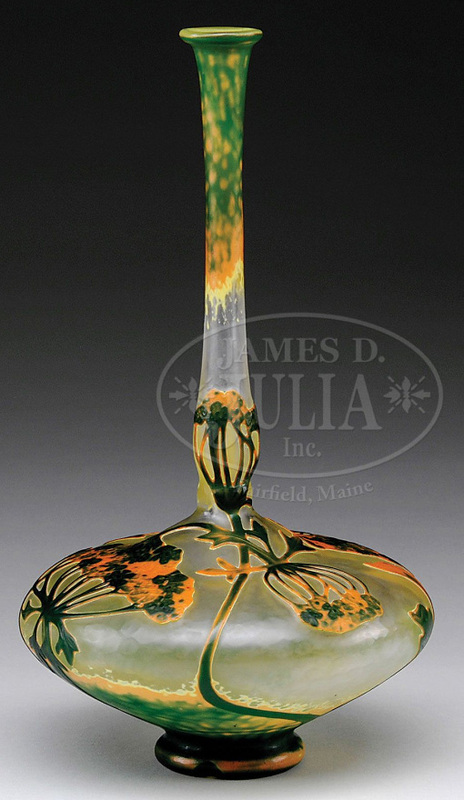 James D. Julia, Inc. held its semi-annual Lamp and Glass auction on November 28-29, 2012. 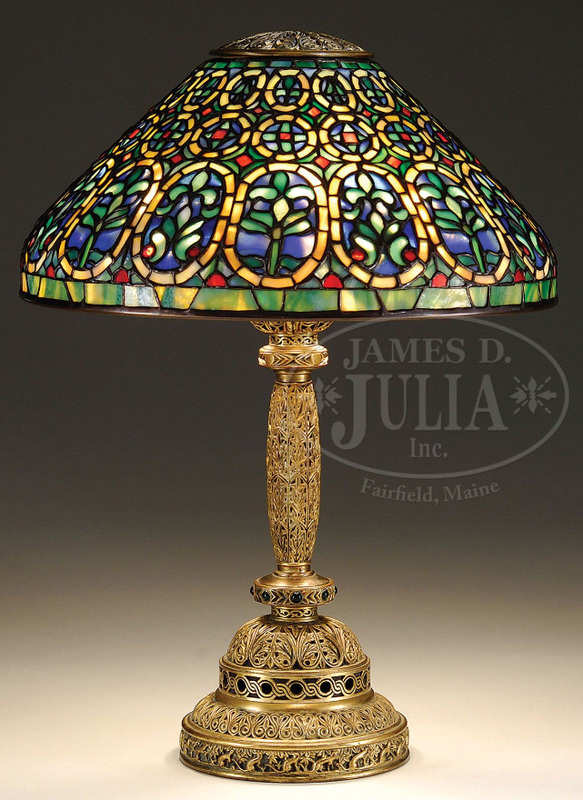 According to Dudley Browne, head of the Lamp and Glass division, it was the best sale he’s had in 10 years at Julia’s. Total sales were over $1.6 million, including the buyer’s premium. Two weeks prior to the sale, Dudley was concerned that the auction might not even reach $1 million in sales. Then Michaan’s had an awful Tiffany sale in California (don’t miss Thursday’s blog). Ultimately his fears were unjustified. Interest was solid across the board, even in categories that had been weak in recent sales. Part of the success was due to the re-emergence of many bidders who had been absent for several years. They probably helped increase the percentage of sold lots to a near all-time high for the division. 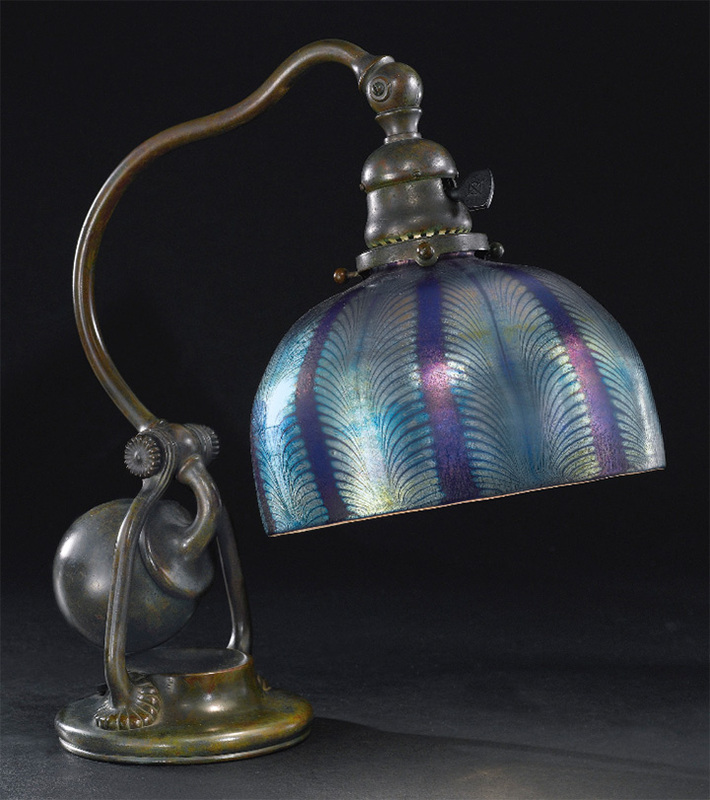 Top lot of the sale was #1314, a fine Tiffany Studios Venetian table lamp. Estimated to sell for $60,000 – $80,000, it realized $103,500, including buyer’s premium. 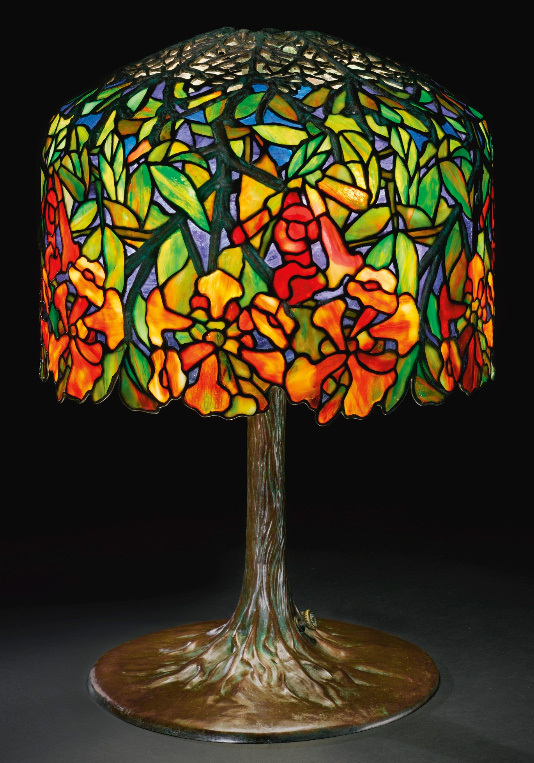 In general, lamps were resurgent, from unsigned leaded to Pairpoint puffies to Tiffany Studios. 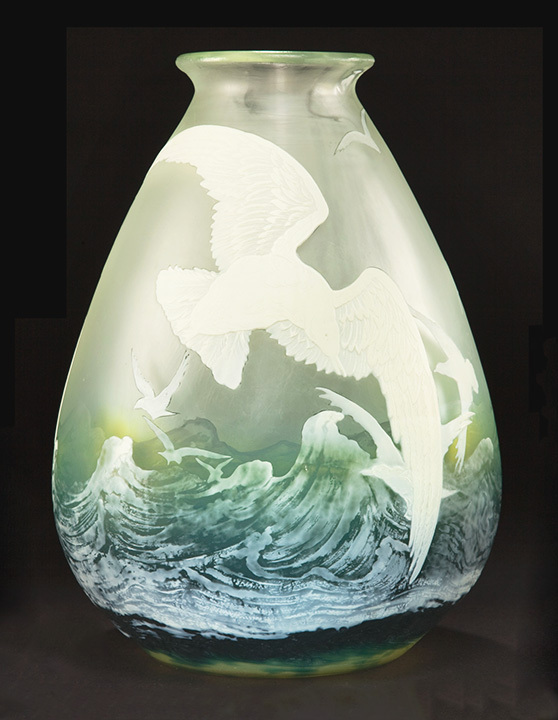 The Gallé selection of glass was strong, anchored by several high quality marquetry examples. Lot #1200, a fine Gallé marquetry vase, sold for $25,875, above the high estimate of $20,000. 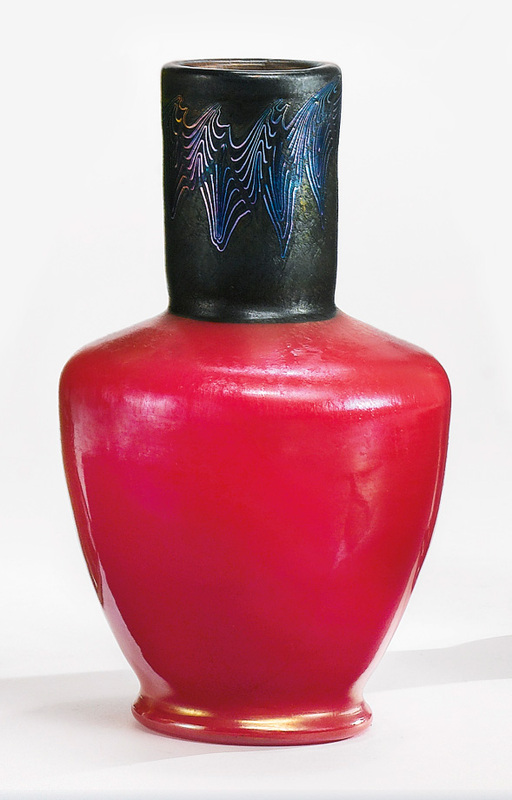 The majority of Gallé vases sold within or above their pre-sale estimates. The top Daum lot of the sale was #1235, a beautifully wheel-carved example. This was the type of vase that used to sell very well to Japanese buyers, but not to American ones. On this day, the vase was well-received by Americans (an assumption on my part). It sold for $23,000, against an aggressive pre-sale estimate of $20,000 – $30,000. For the complete results of the sale, click on the following link. Julia’s Lamp and Glass results. You will have to login (gratis) to see the prices.